Water Heater by Kevin Ginnings Plumbing Service Inc. Available 24/7 - If your water is not hot enough, too hot, or not hot at all, just call (816) 832-4322 whether it’s 9 AM or 9 PM. We understand that the rest of your life doesn’t stop just because your water heater does. Call Kevin Ginnings Plumbing Service Inc. anytime. We can come fix your water heater at night so you can still shower before work in the morning. Water Heater Experts - Does your hot water smell awful? Does the water heater make a lot of noise? You’ve likely got mineral buildup. Does the water take too long to heat up? The heating element or burner is probably malfunctioning. We’ve been in business since 1985, so there is nothing we haven’t seen. It doesn’t matter what’s wrong with your water heater, we can diagnose the problem quickly without all the guesswork. Kevin Ginnings Plumbing Service Inc.’s plumbing experts spot the problem and fix it as soon as possible so you can go on with your day. Dependable - Have you ever seen the price tag on a new water heater? It’s enough to scare you away from using the other guys. 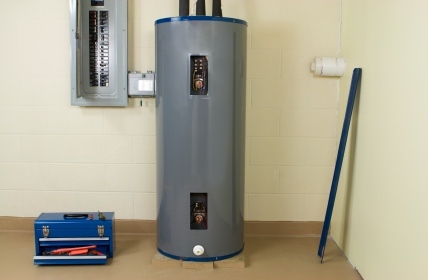 Water heaters tend to be very pricey due to the quality of materials needed to make them. At Kevin Ginnings Plumbing Service Inc., we understand this and take special care to avoid damaging your water heater. Our customers trust us, which is why they’ve kept us in business since 1985. You never appreciate how important hot water is until your water heater stops working. With Kevin Ginnings Plumbing Service Inc., you won’t have to go too long without it! To get your water heater fixed, call (816) 832-4322 for a free quote today!